We waited for months and now the government has responded to our Public Health System claim with an ultra brief reply: you can have a 2.25% wage increase. That’s it. They have flatly refused to improve and extend ratios. Since the offer of 2.25% was made to the NSWNMA, the government has made new statements to public sector unions that this offer may change again, but has not provided details. They have stated that the ‘cash’ increase of 2.25% may vary across agencies depending on the number of employees in SSS and SASS Super schemes. After months of deliberation the O’Farrell Government has come back with a response to our public health system claim, the central feature of which was an improvement and extension of ratios. Their answer: “No”. The government tabled an offer of a 2.25% per annum wage increase, in line with its draconian and inflexible wages law. This wage increase would be even less than the 2.5% paid in recent awards of other public sector workers, after the government shifted the payment of increased superannuation from the employer to the employee. This means the offer of a “cash” pay increase has been reduced from 2.5% to 2.25%. The government has not tabled any written offer on the improvement and extension of ratios. In a media statement the Ministry of Health dismissed this part of the claim with the comment “… the Nurses’ Association demands a one size fits all industrial approach”. The NSWNMA has not agreed to any part of the government’s offer. If it is not accepted by 30 June there will be no back pay when a settlement is eventually reached, as the government has changed the law to prohibit back pay being made. This was done to coerce public sector employees into accepting lower pay rises by rolling back legal rights, including the right to arbitrate wages and conditions in the Industrial Relations Commission, which previously played the role of an independent umpire. NSWNMA General Secretary Brett Holmes says the government and the Ministry of Health are hiding behind the wages law to absolve their responsibility to improve safe patient care and to deny nurses and midwives a fair wage increase. “The real issue here is about safe patient care and that is what we are focused on. The government is focused on holding back public sector wages. It says ratios would require them to go outside the wages policy. This ignores the fact that the government that makes a law can also change a law,” he said. “Ministry of Health officials have told us that the government’s wages law does not allow any extension or improvements to the Award ratios system. Brett rejected the government’s use of its laws to shift the burden of the super increase to workers, and to deny back pay if a settlement comes after the expiry of the award. Brett Holmes says the challenge in the next stage of our campaign will be to convince politicians to change the law so the needs of patients can be met. “We need to increase the pressure on members of parliament to change their law. It is absolutely critical that we move the government from a ‘no’ to a ‘yes’. 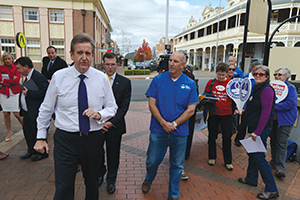 “Barry O’Farrell changed his attitude on coal seam gas because of public pressure. He’s also changed his position on solar panels for the same reason. Brett says that country members in particular have led the way in working with the community to send a strong message to politicians that nurses and midwives are passionate about patient safety.